Camping cottages, located near the lake-shore, each having electricity, picnic table, fire ring and a porch. The six cottages each sleep five people in bunk beds, Also available at the state park are yurts - round, canvas and wood walled tents that have a wooden floor as well as a deck, and sleep five people in bunk beds. Each yurt also has a cook stove, refrigerator, microwave oven, table, chairs, electricity, fire ring and picnic table. The 205 acre park, located in northeastern Indiana County in Banks Township, features a 60 acre lake with two boat launches and ares for picnicking, hunting, hiking, fishing and ice fishing. Two pavilions, at the park, are available on a first-come first-serve basis. The lake is stocked with bluegill, bass, catfish, muskellunge, walleye and northern pike. Fishermen may moor their boats at the park following regulations established by the Fish & boat Commission. Only electric motors and hand propelled boats are permitted. This site features an impressive 45 foot waterfall and scenic woodland. The 48-acre natural area was donated to Indiana County Parks in 1995 by the Keystone-Conemaugh Group, owners of the nearby Conemaugh Generating Station. As a natural area, the site has been set aside to protect both typical and unique plant and animal communities and to protect outstanding examples of natural beauty. Between 1931 and 1956 the property was owned by Fred McFeely, grandfather of Fred Rogers of children's television fame. McFeely, a wealthy industrialist from Latrobe, PA, utilized the property as a retreat. His estate featured a cottage, horse stables, a three car garage, outbuildings and a swimming area in the creek above the falls. Mr. Rogers often visited the site as a child. Stone foundations and retaining walls from the estate are visible at the site. Although the smallest of the County Parks, Memorial Park is one of the most historic sites within Indiana County. Originally surveyed in 1774, the site was once a church cemetery. Many graves are still located in the park. During the Civil War, the site served as a hiding place for travelers of the Underground Railroad. The park's doughboy statue was erected in 1923 by a group of citizens led by Alex Stewart, father of the actor James Stewart. 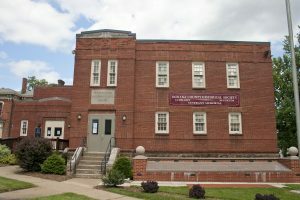 Nearby, is the Clark House and former Armory building, now home of the Indiana County Historical and Genealogical Society. Running the entire length of Saltsburg Borough is a 62 foot wide section of greenway known as Saltsburg's Canal Park. The Park is located on the site of the former PA Mainline Canal that later became the PA Railroad and now overlaps a section of the West Penn Trail. Visitors will enjoy a scenic, river-view walkway enhanced by informative historic signs, a footprint of Canal lock #8, a footbridge, and benches and picnic tables for relaxing moments. Also, a section of the Park, known as North Park, now includes Saltsburg's Veterans Memorial. The water-wave paved sections of the Park between Washington and Market Streets serve as the location for setting up community special events such as vendors booths and food stands during Canal Days and Saltsburg's lighted Christmas Trees display during the month of December. This 10-acre site, located adjacent to Two Lick Creek, is approximately 3 miles south of Indiana, PA. The site is being developed to combine recreational opportunities with an environmental remediation project. The conservation area will include a pavilion with an observation deck, canoe and kayak launch, fishing, trail circuit around wetlands with interpretive signage, path along Two Lick Creek, public restrooms and parking area. In 1991 the Kovalchick Salvage Company donated twelve miles of the former Blacklick and Ebensburg Railroad to Indiana County Parks. The railroad corridor has been recycled into a popular rails-to-trails project known as the Ghost Town Trail. In 1993 the Cambria & Indiana Railroad donated an additional four miles of railroad line from Rexis to White Mill Station known as the Rexis Branch. Access points: Saylor Park; Heshbon; Dilltown; Wehrum; Vintondale, Rexis; Red Mill; Twin Rocks; Nanty Glo; and Ebensburg -- In 1991, the Kovalchick Salvage Company donated sixteen miles of the former Blacklick and Ebensburg Railroad to Indiana County Parks. The railroad corridor has been recycled into a popular rails-to-trails project known as the Ghost Town Trail. In 1993, the Cambria & Indiana Railroad donated an additional four miles of railroad line from Rexis to White Mill Station known as the Rexis Branch. 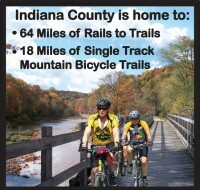 In 2005, an additional 20 miles were added to the trail - 12 miles in Indiana County and 8 miles in Cambria County. The trail is designated as a National Recreation Trail by the U.S. Department of the Interior. The Ghost Town Trail derives its name from five mining towns that once existed along the railroad corridor. Wehrum, the largest of the former mining towns, once boasted 230 homes, a hotel, company store, jail and bank. The town was developed by Warren Delano, uncle of President Franklin Delano Roosevelt. Other ghost towns include Bracken, Armerford, Lackawanna #3, Scott Glen, Webster, Beulah and Claghorn. Eliza Furnace, one of Pennsylvania's best preserved iron furnaces, is located along the trail. This unique relic of the Blacklick Valley's early industrial era is on the National Register of Historic Places. Historical markers along the trail provide interpretive information about the Blacklick Valley's intriguing history. Yellow Creek State Park is home to 3 hiking trails: Damsite Loop Trail - This is a 2.5 mile trail that offers a view of the Yellow Creek dam. To get to this trail, follow PA 259 south from the park office. After taking a right turn at the stop sign, turn onto Hoffman Road - the second road to your right. This road ends at a small parking area where the Damsite Loop Trail begins. This trail can be hiked as an in and out or a loop. The in and out version of this hike would use strictly the eastern leg of the trail which is relatively easy. Adding the loop portion adds a little more difficulty as it winds slightly up and down a hill. The in and out version is kid/family friendly. This is a nice quiet out of the way place with picnic areas as well. Ridge Top Trail - Ridgetop Trail is a challenging 2 mile trail. It begins in the beach/day-use area and winds through a variety of habitats. Laurel Run Trail - The shorters of the three hiking trails, at Yellow Creek State Park, it is ideal to take children on. This trail is a 0.5 mile loop which starts at the Yellow Creek State Park office. This easy hike is especially beautiful in the spring when wildflowers abound. Access points: Saltsburg, Conemaugh Dam - The West Penn Trail is a 17 mile rail-trail between Saltsburg and the Westinghouse trailhead near Blairsville. The trail generally follows the Pennsylvania Main Line Canal and Portage Railroad that operated from 1830 to 1864 between Pittsburgh, PA and Harrisburg, PA. The trail is currently two sections: the Conemaugh River Lake and Saltsburg sections. The Conemaugh River Lake section passes over one of the four spectacular stone arch bridges built in 1907, and offers a great vista from the Conemaugh River. From this point you can also catch a glimpse of the old canal and railroad grade. The Saltsburg section passes through a beautiful backwoods, by visible canal and railroad remnants, hugging the Conemaugh River and covers approximately 17 miles of scenic trail. Located in downtown Indiana, Pennsylvania, is historical Sixth Street. This walking tour takes visitors past 15 notable buildings all located within a four-block area. 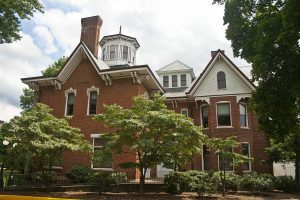 The tour features a Federal style structure house dating back to 1823, an eclectic, two-story brick house that merges two popular styles: Second Empire and Italian Villa. A stone, Gothic Revival church boasts weatherings, buttresses, and large pointed stained glass windows with tracery. 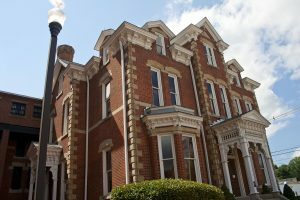 Several of the buildings are listed on the National Register of Historic Places including The Old Indiana County Courthouse, with a clock tower and the Silas M. Clark House characterized by the use of S-brackets, a low pitched gable roof, a bay window, round-headed windows, and a tall, square tower. Come explore freedom's path as you leisurely drive through lush country sides and quaint small towns. In the early 19th century, Indiana County, Pennsylvania, was known for its strong anti-slavery sentiment and willingness to aid fugitive slaves. The first anti-slavery societies were organized in the 1830's, and in the decades before the Civil War men, women and children of Indiana County, black and white, of various religious beliefs and social stations, gave a helping hand to the freedom-seekers traveling on the Underground Railroad. On this driving tour, you, too, will travel the roads, see the places and hear the stories of people who loved liberty enough to risk everything to ensure it to all Americans. The walking tour begins at the Underground Railroad Museum in Blairsville and guides you through the streets and buildings within a twelve block radius. 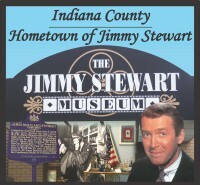 Continue outside Blairsville and follow the driving tour that leads you to various historical sites throguhout the entire Indiana County. This self-guided tour drives the scenic back roads in western PA where you will encounter a growing community of potters. These potters share and promote their love of clay and its creative properties. In the fall, these potters coordinate and present, to the public, an annual Potter's Tour. They clean up their studios, wash the clay off their hands, proudly put their work on display, and warmly invite the public to visit their workplace and to learn about the life of a potter and what inspires their work. On the tour, visitors can see and purchase the work of several different potters throughout the various studios on the tour. The studios are no more than 15 to 20 minutes driving distance from each other. Harmon Bridge, which was built in 1910 at a cost of $525, is 45 feet long and was named after Civil War veteran J.S. Harmon. Built by John R. Carnahan, Harmon Bridge is constructed with town lattice trusses. It is considered a companion bridge to Trusal Bridge and is located on the south branch of Plum Creek just off Five Points Road. One of Indiana County's sites on the National Register of Historic Places. One of the sites listed on the 24 National Register of Historic Places. One of the 24 National Register of historic places. Indiana County established this park in 1966. The dam, known as Cummins Dam, was constructed in 1908 and enlarged in 1912. The park acreage totals 650 acres and features two playgrounds, a volleyball court, horseshoe court, areas for games and sports and a 12-acre lake stocked with trout. In addition, Blue Spruce Park has four pavilions and two lodges available for public rental. The park also contains six miles of hiking and cross-country skiing trails. Located within the park is the Indiana County Master Gardener's Trial Garden where visitors can view the latest floral and plant selections from the Penn State Gardener's Select program. Blue Spruce Park is a premier bird watching spot and portions of the park are open to hunting. Also, noteworthy, an historical marker honoring Bernice Gera, a native of nearby Ernest, PA, is located in the park. Gera was the first female umpire to work in a professional baseball league. At 635 acres, Pine Ridge Park provides a variety of recreation options. Much of the park remains in a natural state with large stands of mature hardwoods. Tom's Run, a scenic mountain stream, intersects the park. Several miles of hiking and cross-country skiing trails traverse the park. It is also home to a 9-hole, recreational disc golf course. The Tom's Run area features picnic tables, grills, playgrounds, restrooms, and two pavilions available for rental. Pine Lodge is located in the southern portion of the park. The lodge is available for group rental and is used for reunions, meetings, weddings, receptions, and other social gatherings. Pine Lodge features a kitchen, restrooms, activity rooms, a deck and two stone fireplaces. A two-acre pond is available for catch-and-release fishing. A playground is also located near the Lodge. Indiana County is home to four covered bridges constructed in the late 1800’s and early 1900’s. The four bridges are Harmon, Trusal, Kintersburg and Thomas. A covered bridge driving map is available by clicking the above link. The oldest of Indiana County's covered bridges is the Trusal Bridge, built in 1870 (also known as Dice's Bridge). At 41 feet long, the Trusal Bridge is the shortest of Indiana County's covered bridges. It was named after Robert Trusal, a nearby property owner. It is considered a companion bridge to Harmon Bridge and is located on the south branch of Plum Creek just off Five Points Road. Trusal Bridge is located about one-half mile downstream of the Harmon Bridge. The Thomas Bridge was built in 1879 at a cost of $545 and completely reconstructed in 1998 at a cost of slightly more than $1 million dollars. Amos Thomas built the original bridge, which is the longest of the Indiana County covered bridges at a length of 75 feet. The original bridge was constructed with town lattice trusses. The Thomas Bridge crosses over Crooked Creek near Yarnick's Farm Market. The bridge was also known as Thomas Ford Bridge - prior to the construction of the bridge, there was a fording stream crossing at this location. When the railroad was constructed in this area in the early 1900's the bridge was also known as Thomas Station Bridge. Kintersburg Bridge was built in 1877 and named for Isaac Kinter, a local shopkeeper. J.S. Fleming erected the bridge over Crooked Creek at a cost of $893. The Kintersburg Bridge is the only Howe truss bridge in Indiana County and one of only five Howe truss bridges remaining in the state of Pennsylvania. It is 68 feet long. Evergreen Conservancy is a relatively new non profit in the Indiana area. Our mission is to advance the preservation, protection and stewardship of Natural, Cultural and Historic Resources in and around Indiana County. Since our inception we have focused our attention on AMD remediation, development of the Tanoma Wetlands Educational Center, and making it possible for home owners to conserve their lands for generations. 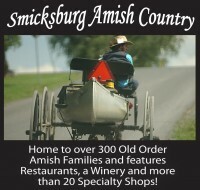 We are a group of caring and committed volunteers who work to raise the quality of life in and around Indiana County. We seek to preserve wild life habitat, land, stream access, scenic vistas, working landscapes, and historic and cultural sites. Our crown jewel is the Tanoma Wetlands Educational Center. At this site you can find: a pavilion, a new StoryWalk –“Grandfather Twilight”, parking lot, handicapped accessible trail with tree and plant ID signs, a wind turbine, a water power generation system, solar panels, and a self guided system of signs explaining how iron is removed from AMD. . Directions from Indiana:: Take Route 286 East, Turn left on Tanoma Road, continue on Tanoma Road until you reach Rayne Church Road, turn left on Rayne Church Road, the educational center is on your right, there is a parking lot. The Eliza Furnace is a National Register site regarded as one of Pennsylvania's best preserved iron furnaces. Dating from 1846 the Eliza Furnace is one of only a few iron furnaces remaining in the United States which still retains its original heat exchanger piping. The two-acre site is leased to Indiana County by the Cambria County Historical Society. Eliza Furnace was constructed in 1845 and 1846. At its peak, the furnace employed over 90 people and utilzed 45 mules to produce about 1,080 tons of iron a year. The furnace was not a financial success, and operated only three years. Difficulties in transporting iron by teams of horses to Ninevah on the Pennsylvania Canal, poor-quality local ore, and a significant drop in iron prices sealed the furnace's fate. Despite its early closing, Eliza Furnace helped bring the industrial revolution to the Blacklick Valley. A detailed history of the furnace is available here in PDF format. Additional information about Eliza Furnace and other iron furnaces in Pennsylvania can be found at the Industrial Archeology and PA Iron Furnace Sourcebook websites.